A Textron subsidiary and Poland’s state-owned defense company Polska Grupa Zbrojeniowa have signed a letter of intent to explore possible areas of cooperation on the UH-1Y Venom utility helicopter platform. 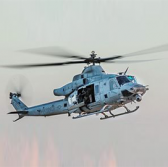 The LOI is in addition to a similar agreement Bell Helicopter and PGZ signed last year to identify business opportunities for the AH-1Z Viper attack helicopter in Poland, Textron said Tuesday. Both parties agreed to discuss ideas that the U.S. manufacturer may transfer to Polish arms suppliers as well as the scope of production and maintenance efforts that PGZ subsidiaries may perform if Poland’s defense ministry decides to buy AH-1Z and UH-1Y units. “We strongly believe this step with PGZ provides a solid basis for further relationships and shows Bell Helicopter’s commitment to supporting Poland’s military objectives and desire for industry growth,” said Rich Harris, vice president of Bell Helicopter’s international military business. The Polish government seeks to acquire attack helicopters as part of a new modernization initiative for the country’s armed forces. AH-1Z and UH-1Y helicopters are designed to thrive in both sea- and land-based environments.